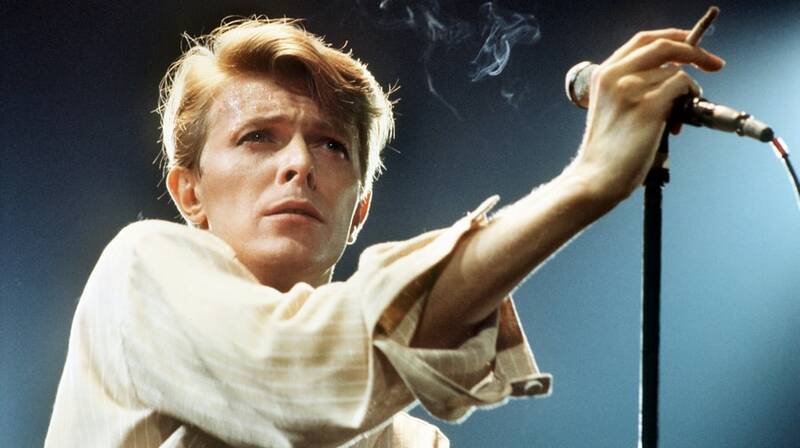 With a career that dated nearly 48 years and a reputation as rock’s greatest chameleon, David Bowie has managed to team with the best and brightest of every generation’s rising underground — glammers, punkers, art-proggers, disco masters, rappers, R&B stars, industrial brooders, electronica blippers and contemporary indie rockers. But that doesn’t mean he’s not down to work with Cher, Bing Crosby or a Beatle. Here’s 30 of Bowie’s collabos from the iconic, to the underrated to the curious. 1975 was a dark year for Bowie, who spent much of the year binging on cocaine and exploring the occult while recording Station to Station. But he made time for a surprisingly family-friendly appearance on Cher’s CBS variety show. He and Cher performed a melancholy duet of the Young Americans ballad “Can You Hear Me?” as well as a medley that sandwiched songs by the Crystals, the Platters, Bing Crosby, Bill Withers, the Beatles and more between “Young Americans” itself. Bowie was a major early supporter of Luther Vandross’ career, bringing the younger R&B singer on to sing backing vocals on the soul-influenced Young Americans album and help arrange vocals for the title track. When Vandross became a star in his own right, he returned the favor by covering Bowie’s song in concert. Bowie met German performance artist and musician Klaus Nomi in New York in the late Seventies and invited him to sing backup when he did Saturday Night Live in December 1979. Nomi was a rising star on the NYC art scene but was virtually unheard in the culture at large. They performed three songs on SNLfrom throughout Bowie’s career including a memorable “The Man Who Sold the World” and Station to Station‘s “TVC15,” for which Bowie donned a skirt and heels while Nomi and co-conspirator Arias led a pink plastic poodle around the stage. It’s a classic example of Bowie reaching into the underground to transform a pop culture standby. Like so many great musical moments, this pairing of Seventies rock giants came about by chance. Both Bowie and Queen were recording in a Swiss studio; Bowie agreed to add some backing vocals to a negligible Queen cut called “Cool Cat.” (He was unsatisfied with his contributions, which were later erased.) Then the musicians began jamming over a simple, repetitive, yet indelible bassline that seems to encapsulate everything that’s both exhilarating and nerve-wracking about modern life. On the final recording, we hear two of rock’s most singular voices feed off and rise above that anxiety – Mercury soaring effortlessly, Bowie climbing tenaciously. By the Eighties, electronic disco pioneer Giorgio Moroder had become sought after for soundtrack work, and director Paul Schrader hired him to create the music for the sexed-up 1982 remake of the Forties horror classic Cat People. 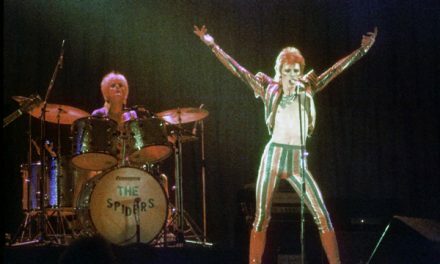 Since no rock star quite captures sexed-up horror like Bowie, he was brought in to provide lyrics and vocals for the title track, a minor hit in the U.S. – his first in years. The version you hear on Let’s Dance is a re-recording: Moroder’s record label, MCA, refused to allow him to appear on an EMI America LP. Hoping to make a commercial party record, Bowie asked Nile Rodgers, whose guitar work with Chic had defined the funkier edge of disco, to produce and play rhythm guitar on his next release. The groove Rodgers laid down would help define the sound of Eighties pop in America, and led Rodgers to high-profile production gigs with Madonna and Duran Duran. Vaughan’s fiery lead guitar can be heard throughout the Let’s Dance album — Bowie had bonded with the young hotshot virtuoso over their shared love of Texas blues at the 1982 Montreux Jazz Festival. Bowie was instrumental in helping Tina Turner secure a recording contract with Capitol Records in the early Eighties, eventually leading to the blockbuster success of 1984’s Private Dancer (where she covered his “1984”). That same year, Turner appeared on the lilting title track from Bowie’s Tonight. “Tonight” had originally appeared as a dark, sinewy song on Iggy Pop’s Lust for Life. Reviving it with Turner, he gave it a lilting reggae feel. When they performed the song together on her Private Dancer tour, they sang it together movingly as they slow danced. Bowie provided impressionistic lyrics to a melody that fusion guitarist Metheny had written with his keyboardist, Lyle Mays, for the John Schlesinger film The Falcon and the Snowman. A minor hit, the song was a fittingly somber theme for the story of a former CIA man (Timothy Hutton) and his coke-addicted pal (Sean Penn) who became Soviet spies. In 2001, P. Diddy sampled the track for “American Dream,” his disillusioned contribution to the Training Daysoundtrack. “I used to dream of being Mick Jagger,” Bowie once said, according to biographer Christopher Sandford’s Bowie: Loving the Alien. In the mid-Eighties, Bowie linked up with his hero for a cover of Martha and the Vandellas’ Motown classic “Dancing in the Street” to raise money for Live Aid. The eccentric, energetic video has surpassed the recording, as the two legends booty shake and dance with wild abandon through the, well, streets. After his bona fide dance-pop success of the early 1980s, thanks to “Let’s Dance,” Bowie turned back to a relatively stripped-down approach for his 1987 solo album, Never Let Me Down. The record turned out to occupy a strange space in his catalog — meandering and not exactly cohesive, it succeeded commercially while being underrated by fans. One of the shining moments on that effort comes courtesy of an unexpected cameo by actor Mickey Rourke. In the middle of “Shining Star (Makin’ My Love),” an exploration of anxiety and global disaster over proto-Big Beat electronics, Rourke provides a guest rap(!) that comes off like a jazzy catalog of society’s ills. According to a statement from Brian Eno after the news of Bowie’s passing, both artists had been discussing revisiting their 1995 collaborative album,Outside. Discussed far less than other Bowie full-lengths, it’s one that deserves reconsideration: It’s a high concept work, set in a sci-fi dystopia, that continues some of the best themes in his 1970s work. It also yielded some excellent dark, synth-y disco, like this song, remixed by the Pet Shop Boys for its release as the LP’s third single. At the end of the last millennium, drum’n’bass seemed like the electronic avant-garde, a sound ready to take up various musical threads — reggae, hip-hop, soul — and push them, splintered, into the future. Is it any surprise, then, that David Bowie would seek to work with one of its most exciting proponents, Goldie? Surprisingly, though, this track — off Goldie’s sophomore album, 1998’sSaturnz Return — skips all of the breakbeats in favor of atmospheric washes, tinkling piano and Bowie’s late-period, deeper timbre. If any commercially successful guitar band came close to reviving the gender-bending, moody spirit of David Bowie’s brand of glam rock, it was Placebo. As such, this title track from the band’s sophomore album had to represent the ultimate dream come true, especially for its heavily eyelinered, unapologetically tough-and-pretty singer Brian Molko. Here, his adenoidal, lovesick lead gets anchored by Bowie’s reassuring backing vocals. Trip-hop pioneers Massive Attack were initially reluctant to contribute to the 2001 soundtrack of Baz Luhrmann’s Moulin Rouge, but they were won over after hearing that they’d be collaborating with an enthusiastic David Bowie. Having already been commissioned to cover Nat King Cole’s 1948 standard, “Nature Boy,” Bowie lent a lilting, nuanced reading of the song over Massive Attack’s moody and ominous backdrop of looped string samples and bursts of guitar noise. In 2007, Scarlett Johansson and TV on the Radio’s Dave Sitek traveled to Lafayette, Louisiana to record an album of Tom Waits covers. At a party in Los Angeles before the sessions, Johansson ran into Bowie, who asked about the project. Weeks later, as Johansson was in Spain filming a movie, Bowie stopped by as the album was being mixed and cut vocals for “Falling Down” and “Fannin Street. '” “It was the best phone call I ever got,” Johansson told RS at the time. 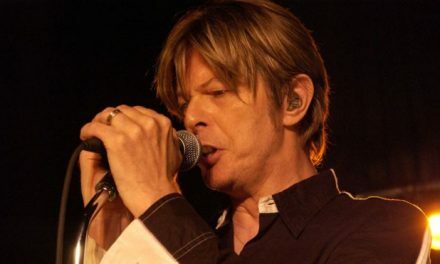 After staying relatively quiet in the wake of his heart surgery in 2004, Bowie surprised the crowd at London’s Royal Albert Hall two years later by walking onstage during friend David Gilmour’s set. He howled Pink Floyd’s first single, the garage-y psych-rock classic “Arnold Layne.” The song, about a man who steals women’s clothes, was banned from radio when it was released in 1967; at that time, Bowie was just getting started and there was no bigger act on the underground English rock scene than Floyd. (Bowie especially adored the eccentric Syd Barrett.) Bowie finished the Royal Albert Hall set with a take on “Comfortably Numb” under psychedelic lasers. Bowie made the song unmistakably his own, proving he’d lost nothing in his years off the stage.